The Kingdom of Lesotho is an independant state in southern Africa which shares all borders with one country - the Republic of South Africa. Situated between 28° and 31° southern latitude and 27°and 30° eastern longitude, Lesotho is completely outside of the tropical climatic zone and therefore free from any tropical decease. Lesotho is the onliest country in the world which lies completely above 1000m, having the lowest point at about 1388 m above sea level. The highest mountain in the eastern part of the country is is with 3482 meters the highest point in southern Africa. The area is ca. 30.500 Square Kilometers, about the size of Belgium. Visitors like to call Lesotho `The Kingdom in the Sky´ or `Switzerland of Southern Africa´, due to her fascinating mountain scenery and the refreshing climatic conditions. The annual rainfall is 700 mm on average. Most rain falls between October and April but there is no month without a minimum rainfall of 20 mm. The temperatures ranges between -8° in winter and above +32° im sommer in the lowlands. In the mountains the temperature difference is much higher. Lesotho can be devided into four zoness. It is based on geological, topographical and agricultural activities. The four zones are: Lowlands 1500 m - 2000 m, Foothills 2000 m - 2300 m, Mountains 2300 m - 3482 m, Orange River Valley above 1388 m (inside mountain zone, long, deep valley). 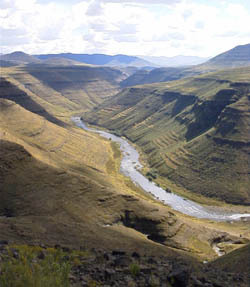 Lesotho's high altitude and richness in water created over millions of years a unique scenery which presents itself in deep valleys, high waterfalls and treeless plateaus. 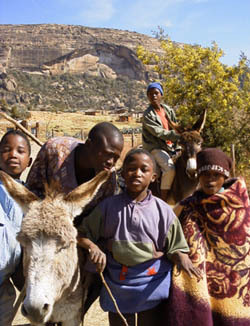 The waterrich valleys already attracted bushmen tenth of thousands years ago. Today, their existance can be seen in many caves with bushmen paintings. The first inhabitants of Lesotho were dinosaurs. They are millions of years old and petrified footprints can now be seen in some valleys around the country. 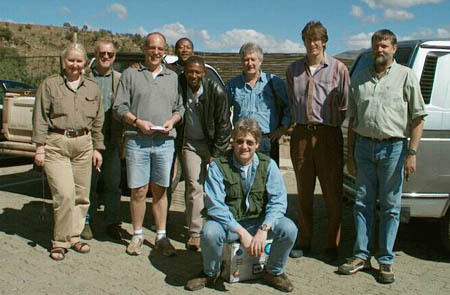 Lesotho´s mountain area was virtually unaccesstable for tourists and visitors over the past centrury. The high mountain passes and the the deep valleys restricted the `horseback´ as the means of travel. 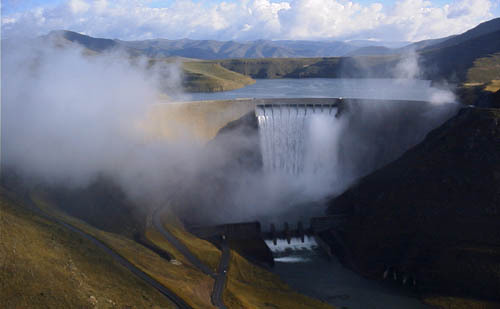 Infrastructure has developed rapedely during the past decade and the almost untoched Basotho culture which is still existing in the mountain areas can now be experienced by visitors. Some villagers have opened their doors and host visitors who want to stay with their family. A unique down-to-earth experience, life in an african mountain village.